In September 2017, we had 250 recovery community members come out to support our Recovery Walk in Ghana, including Dr. Al Mooney and five other Americans. The walk was held in Ashaiman near the House of St. Francis. Recovery Africa considers this walk to to be the most successful walk to date because of the enthusiastic participation of our recovery community members, their family members and the residents of Ashaiman. The post walk events helped us carry forward our message that recovery is possible. Jerry Gillen died unexpectedly in the summer of 2015 of an accidental drug overdose. He is remembered fondly by many. Please click here for a moving tribute by Patty McCarthy Metcalf, Executive Director of Faces & Voices of Recovery where Jerry served as Director of Operations. My wife and I have managed a non-profit charity in Ghana called Books For Africa Library Project since 1997. In 2000 we began to distribute Alcoholics Anonymous and other AA literature to Ghanaians as we set up libraries. AA meetings struggled when I went to the States. Long-term recovery in Ghana seemed to require an in-depth exposure, a residential programme. Off and on over the past five years we have had a peer recovery programme for men in Kukurantumi. While we currently do not have a residential recovery house, we do make weekly visits to the Government Hospital in New Taft and St Joseph Hospital in Effiduase to give out information on Alcoholics Anonymous and Al-Anon. With the support of the World Service Office of Alcoholics Anonymous in New York City, the AA Intergroup of Ghana has published 2000 copies of Alcoholics Anonymous, the "Big Book", in Twi. We also have Al-Anon literature available in Twi. The support of Recovery Africa will be important in illustrating to people that recovery in the rural areas of Ghana is connected to a nationwide and continent-wide recovery movement. By being associated with nationally and internationally known leaders, it helps us to show our local residents that they are not alone in their struggle with a powerful disease. 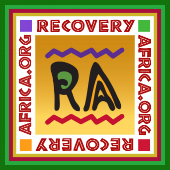 Recovery Africa brings the experience, strength and hope of millions into our small town. When we have visitors from Accra or from overseas, the residents begin to understand that sobriety is meant for everyone on every continent.